A friend of mine from San Diego has been working as a maître d at Thomas Keller’s celebrated restaurant in Per Se in New York for some years now. Knowing that I have been working with the Franciacorta consortium, he recently told me about how Franciacorta consortium president Maurizio Zanella visited the restaurant for dinner earlier this year. He met Maurizio back in 2008 when I was living in San Diego and he and I had dinner together with some food writers at Jaynes Gastropub, where my friend was working at the time. And so he recognized him. He pointed out to me that the restaurant’s wine list currently includes Maurizio’s Franciacorta Annamaria Clementi Riserva Rosé 2005. 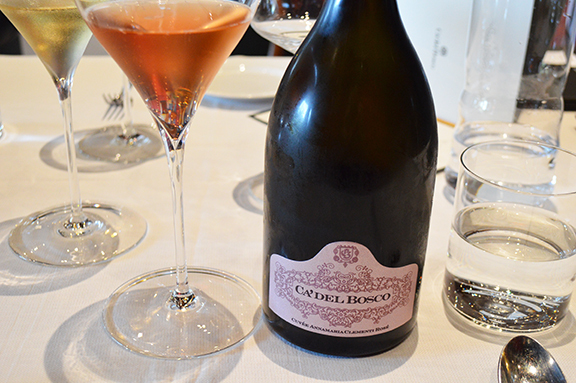 I had the chance to taste the wine at the Ca’ del Bosco winery in August when I was visiting the appellation (above). Because I was visiting with a noted wine writer, Maurizio started off our tasting with a 1979 Franciacorta disgorged à la volée and he reminded me that 79 was his second vintage. From 1979 to 2005 to 2015, I thought to myself at the time. Franciacorta as we know it today is a very young appellation. The earliest classic method wines were made there in the 1960s and Ca’ del Bosco, the appellation’s most visible estate, only began producing wines with the 1978 harvest. But even in that short span of time, Franciacorta has managed to reach the highest peaks of fine dining throughout the world. The fact that Maurizio’s wine is on the list at Per Se is just one example. It’s also an example of Franciacorta’s immense potential in a world increasingly crowded with sparkling wine. Franciacorta, you’ve come a long way, baby!